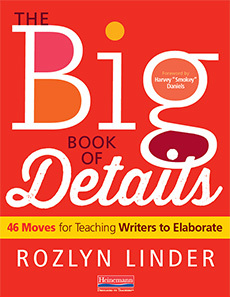 Thank you for your interest in The Big Book of Details by Rozlyn Linder. In these samples, you will learn how you can use this book as the ultimate teaching tool for helping writers use details to improve their writing. Try out some of Roz's strategies in your classrooms today! They are ideal for minilessons, small groups, or one-to-one conferring. Excerpts from chapter three (Details that Dance), including if-then charts for you and your students, a sample lesson, and an example of Roz's trademark classroom charts.